In this landmark year of the NHS turning 70 and 50 years since the Social Work (Scotland) Act was introduced, the Scottish Patient Safety Programme (SPSP) is marking its own milestone – 10 years of improving safety. Since its launch in 2008 the programme has expanded to support improvements in safety across a wide range of care settings and themes including Acute and Primary Care, Mental Health, Medicines, Maternity, Neonatal and Paediatric services. 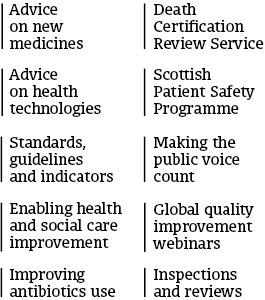 All of which have been underpinned by the robust application of quality improvement methodology to bring about significant change in outcomes across Scotland. Central to these improvements has been the relentless focus on the programmes overall aim to improve the safety and reliability of care, reducing harm whenever care is delivered. From patients and families, front line teams, the SPSP Programme Managers and Board Executive Sponsors to our SPSP national team within Healthcare Improvement Scotland’s ihub, this truly is a nationwide safety movement which continues to improve the quality and safety of care each day. And yet this is only a small glimpse of the improvements that have been made and in truth, impressive as they are, tell only part of the story. In our experience improving safety has resulted in improvements in many more aspects of quality. For example the 31 per cent drop in pressure ulcers is the equivalent to 46 fewer pressure ulcers a month. In reality that means fewer patients in hospitals are experiencing the pain and discomfort caused by this key harm, their length of stay is not extended because of the requirement for additional treatment which results in the avoidance of associated costs of approximately £184,000 per month (if all were a Grade 2 pressure ulcer). The continued adaption of the SPSP offer to meet the needs of people and services within the evolving health and now social care context reflects the continued commitment to safety both locally and nationally. In 2008 it was not envisaged that we would have safety improvement programmes in dental practices and in care homes, but we now do. SPSP is now embedded within Healthcare Improvement Scotland’s Improvement Hub (ihub) supporting improvements across NHS boards and the new integration authorities. As we start to consider what next for SPSP, it is important to reflect on the achievements so far, use the learning to inform our future approaches but l believe the aim of improving the safety and reliability of care, reducing harm whenever care is delivered will remain true to all involved. Joanne Matthews is Head of Improvement and Safety at Healthcare Improvement Scotland.